Cool colourful 1-ich bookish themed badge. 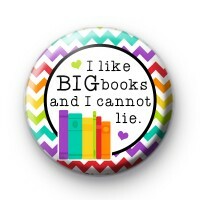 This fun badge has the text 'I Like BIG Books and I Cannot Lie, written in a typewriter font. If you enjoy reading, love books and have a huge book collection then you need this badge in your life.